As I sit down to compose my thoughts at the end of this week, I’m sitting in an office on the ground floor of a building on the Stanford University campus. (I teach three days a week and work for ACT two days a week). I’m ruminating about the Met Life survey that came out this week, showing teacher morale around the country has reached a new low (EdWeek article; Met Life site). 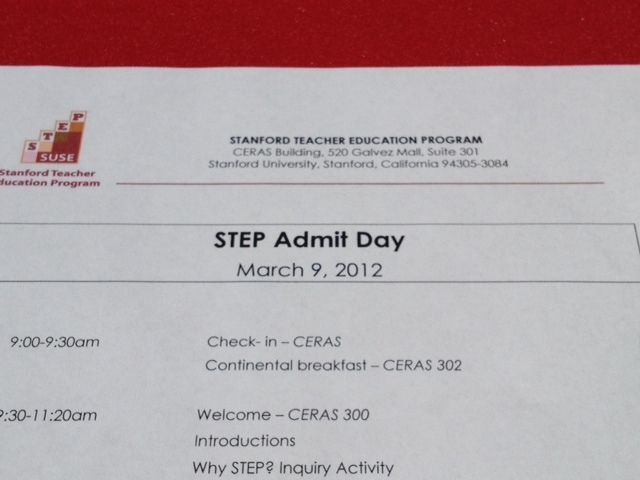 Meanwhile, directly over my head on the third floor of this building, the Stanford Teacher Education Program (STEP) is holding its Admit Day event to welcome prospective students and encourage them to choose STEP. It’s a decision I made eighteen years ago this spring, and one that I’ve never regretted. I sat down for lunch with some of the prospective “STEPpies” as they’re known here, and tried to get a feel for their frame of mind. Why are they going into teaching? Those I talked to seemed aware of the challenges – one immediately told me about a teacher friend getting a pink slip for the third year in a row – but sanguine about their long-term prospects in the career. 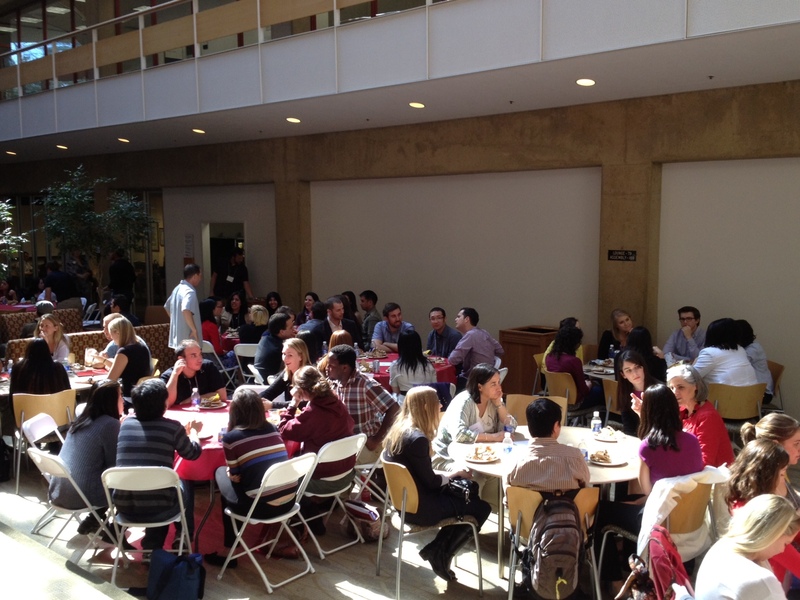 Future teachers at the STEP Admit Day luncheon, 3/9/12. I want to be optimistic and enthusiastic for the young aspiring teachers in the building today. I want to believe that they are going to help us build and strengthen the teaching profession, and that they will enter a career where they will thrive, and in turn, help our children thrive. In the long run, I suppose I am optimistic. This too shall pass. I can’t believe, can’t let myself believe, that we as a nation or as a state will allow our public education system to implode. But how long will it take to turn the pendulum, and how much damage will be done in the meantime? Much has been written already about the twenty-year low point in teacher morale, the numbers of my teaching colleagues who are demoralized, pessimistic about improvement, and considering leaving the profession. I won’t rehash the numbers here. For anyone following American education politics and “reform” efforts, these results are not surprising. We’ve known for a long time that teachers are under attack, unfairly blamed for systemic shortcomings (both educational and financial), and unheard by our political leaders. Teachers have offered up better approaches to school reform, and teacher solutions to issues like performance pay and evaluation, and when necessary, we’ve demonstrated against the laws and policies that hurt our schools and students. We’ve raised our voices in warning like a Greek chorus, and watched one – misguided – policy – initiative – after – another – in states, and localities – across the country. I’m reminded of the saying, “The beatings will continue until morale improves.” For those in positions of power and influence, it’s worth stopping to think about that idea. The teaching force is demoralized. What is your part in creating the conditions that spawned such low morale? It doesn’t matter if your failed policy pronouncements and actions are sugar-coated with platitudes. “But we love teachers! We need teachers! We should honor teachers! We should pay (the best) teachers more!” Words unsupported by actions don’t help. Is there any accountability among policy makers and “thought leaders” when they see the results of their handiwork? I know that if morale in my classroom turned out to be as low as the results of this survey, I’d be digging deep inside myself for solutions. Pessimism and worry are pervasive in American schools. Contending with elimination of services, suffocating poverty, more layoffs, larger classes, and an accountability regime at odds with genuine teaching and learning, America’s teachers are freaked out. Now, I don’t know Ms. Shields or her organization, so I will give some benefit of the doubt regarding the context and intent of this quotation. But if it’s accurate, I’m troubled by the idea that almost a third of our teachers are thinking of leaving and she’s ambivalent about having “concerns” because these might be ineffective teachers. Is it really possible that we could have this many ineffective teachers and not see that as an indication that we need massive systemic improvements? Does she imagine that those hundreds of thousands of teachers are going to be replaced by inherently effective teachers, newly-minted and ready to overcome whatever systemic dysfunction drove out their predecessors? Ms. Shields noted that, for her, the “most disturbing finding” in the report is one showing that 43 percent of teachers are pessimistic that the level of student achievement will increase in the next five years. “That really requires us to rethink the teaching profession if that many people are unhappy and don’t think they can have any impact,” she said. The EdWeek article also considers, and rightly so I think, the likelihood that teacher morale is affected by testing and teacher evaluation reforms that would foolishly incorporate testing data and “value-added” measurement. I have to take issue with Ms. Jacobs’ assessment here (again, assuming it has been reported accurately). I don’t agree that teachers see these efforts as ways to label all teachers ineffective; what we see are wildly unstable measures pointed our way in a game of professional Russian roulette, where any teacher with a value-added rating might come out looking highly effective or ineffective due to factors beyond our control. In any given year, teachers evaluated based on test scores won’t be able to predict whether the data-fairy will sprinkle the spreadsheet with good or bad magic dust (or eraser rubbings). Our fears are not irrational, not merely a matter of perception as Ms. Jacobs suggests. Anthony Cody, writing at Living in Dialogue, sees a silver lining in the debacle in New York: “[S]omething new is happening this time, and it was not what proponents of the use of these ratings for evaluative purposes intended or wanted. People are actually delving into the data to see what it shows.” For some of us, this is sort of an “I told you so” moment. Perhaps the prospect of losing so many teachers will shock some people into paying more attention to what teachers are saying about the state of the profession and schools in general. For the sake of our students, my colleagues, and the future teachers I met today, I certainly hope so. My guess, David — and this is something that I’ve written about time and again — is that the vast majority of people ready to leave the profession are the super-talented. Think about it: The most talented folks want to be inventive and creative. They want to work passionately on their passions. They want to design solutions based on what they know and what they learn collaboratively with their peers. Industry learned those lessons long ago. That’s why companies like Google and Method focus specifically on designing workplaces that support and encourage creativity. They don’t want to lose their best workers. Schools — despite being drowned in corporate reform efforts — haven’t learned that simple lesson yet. As a result, we aren’t an attractive professional home for bright minds. My guess: The STEPpies that you photographed will quit sooner rather than later. While they see teaching as a noble and rewarding profession, they don’t realize what’s lurking behind the professional curtain. You hit it on the nose, Bill. In my short tenure in teaching (ten years) I’ve seen eight high quality teachers leave the profession altogether. Two had been our building’s “Teacher of the Year.” Two different ones were rather newly minted NBCTs. All eight would have been on the shortlist of teachers whose classrooms I’d throw my weight around to get my own kids into when they eventually make it to H.S. It is not just that the better teachers are likely to look, it is that they are more likely to qualify for non-teaching professions: all the things that make a great teacher also make a great ___ (insert any occupation here). Ineffective teachers don’t have the skills and dispositions for occupational mobility, even if they wanted to leave. So. When the good teachers leave, who is left? Bill: you are soooo right on! I teach high school Spanish. I’m highly educated, highly intelligent, and based on reports from my students, their parents, subsequent teachers, and college placement tests, I’m highly effective. The reason I left the business world and went into teaching is because I saw an opportunity to unleash my creativity, to be challenged by students and find solutions to complex and (for me) intriguing teaching problems. I feel that I’ve had a profound effect on my students–many of them spend a summer in Spain studying Spanish and interacting with young people from all over the world, thus expanding their horizons and returning to Oklahoma with a worldview FAR more sophisticated than that of their peers. When taking college placement tests to determine which level of Spanish they should be put in, even my ex-students who don’t study in Spain are asked if they were in an immersion program, because they speak so well. I think that makes me a highly effective teacher. Sadly, I’m also a highly demoralized teacher at this point. I’m thinking about retiring early, seven years earlier than I’d planned to leave the profession just a few years ago. I adore teaching, I adore my students, but I’m tired of being demonized, and I’m tired of an administration so stressed out from dealing with the new education problems that they keep making really stupid decisions about teachers and scheduling. What truly saddens me is that it’s the students who are losing in all this. Thanks for your comments. I’ll have to zip over to The Tempered Radical and find some of Bill’s posts on the topic. Everything you’ve written above (both of you) sounds familiar and logical, but I’m not sure that less effective or less talented teachers have much higher morale or greater desire to stay in teaching. First of all, some of those highly effective and highly talented teachers are the same ones who astound me with their optimisim and resilience. Not to say they’re happy about the current state of affairs, but they don’t talk about walking away from it. Secondly, and more unfortunately, I think teachers who are less inventive and less creative in the classroom might be just as demoralized. I think you make a good point too, David. While I have certainly seen the same exodus of great teachers that Bill mentions; I also know many excellent teachers who simply refuse to leave because things have gotten so bad. They argue that by making the field so unattractive, students will suffer even more if those who have some skill as teachers leave, and there are no mentors for those who do enter. It is a tragic, and unnecessary, paradox. One of THE very best teachers I’ve ever known is retiring this year. She’s been TOY for our large district, and is a phenomenal math teacher. She’s not ready to retire, but the stress from all of the extras became too much. She knows what good teaching is, and what her students need, but has been denied the chance to do it. It is a huge loss for the profession. Like yourself, I’m trying to digest the information from this report this weekend, and I can’t help feeling that we need a better way to talk about these results. While most of the headlines take an ominous tone, I look at the data in more detail and see that in actuality, 81% of the teachers are satisfied with teaching. Where do we go from here? I don’t know- but we need better ways of understanding how teachers feel about the profession. Then, we need better ways for talking about it…. Thanks for the posting David and comments from colleagues. It’s past 11:00pm (finally done inputting writing scores on our new comprehensive data system) and I am finally getting a chance to read this entry that I have been saving for a few days. When I read that the survey showed that Teacher satisfaction was at an all time low, I was not a bit surprised. Why? Because I have lived it for the past several years in the field. Just this week we found out that over 50% of the current teachers at our urban school will get pink slipped. Most of these teachers are leaders of the school, earned NBC, Masters, and even a doctorate in education, but once again will be told they may not have a job this fall. FYI, just three years ago, our school lost 8 newer teachers to budget cuts as well. Tell me how that impacts school culture and student achievement. I have guided some amazing student teachers in the past several years, only to see them not find teaching jobs, or find them and lose them when their charter school closes, or get laid off at a smaller school district, or worse, they decide to leave the profession altogether. Sad for them, sad for me, sad for us. This is my 25th year of teaching. Although it has not been easy these past few years, I still love the classroom. I love the sights and sounds of my students discovering, learning, and growing to the best of their ability. I plan to stay as long as that passion is still there, but it hasn’t been easy. My colleagues and I have felt the pressures of high stakes testing and new programs “designed” to ensure success. We feel the loss of time we actually have to teach our students, and the freedom to create and innovate as we once had. Many of us are still determined to provide our students with rich learning experiences and the time for them to engage in them, but sadly, many teachers can’t. The past three weeks I have been conducting district mandated assessments, and that’s not counting the weekly assessments students take. They are 6 years old and will be doing this for the next 12 years. We worry about teachers burning out and leaving the profession; I also worry about the students we are serving as well. The weight of the world bears down on each of us, and yet each day we have the privilege of walking into a room full of children with their whole lives ahead of them and we get to share the joy of learning with them. That should be motivation enough for all teachers, but sadly, it isn’t. In many schools, like mine, teacher layoffs and increasing class size have caused teachers to be relocated around the district – “bumping” according to seniority. Involuntary transfers account for about half our staff, myself included. My transfer to this school resulted in a teacher having to leave. The same year two other teachers were involuntarily moved to this school, and the same year five teachers received pink slips. Two were rehired over the summer and returned to our site, while the other three were happily rehired, but placed in other schools. (As an aside, these teachers have ten to twelve years of service in our district.) Due to the change in staffing every year, teachers are moving grade levels causing a lack of community and trust. The only constant in our school site is change. Is it any wonder that our site is having an issue with climate? How do teachers who are continually battered with the realities of budget cutbacks in all its incarnations come to work with fresh, innovative ideas, willing to go above and beyond to make learning creative and engaging? After years of teaching kindergarten, I will be moving up to teach 5th grade next year. I will have to dig deep to find the time and energy to make learning fun and meaningful for my students. In kindergarten, I must admit, making learning fun comes very naturally – the kids are excited to be at school, we do fun stuff, we sing and dance, we do art projects, everything is entirely hands-on. The older students get, the less of these fun things they get to do. In a conversation recently with a colleague, I voiced my wonderment that kids in the upper grades don’t do enough fun stuff and ended with “why is that?” She said, “it’s because there’s too much content to deliver.” What are we, UPS drivers? My name is Ashley Modozie. I attend The University of South Alabama. I am majoring in secondary education and English. In my technology class, we are given the opportunity to read educators blog post and comment on them. I was assigned to comment on your blog this week! I think that this topic is very important to our educational system. My mother is a teacher and she has been teaching for over 14 years. We discuss topics like this often. I think it is sad that this assessment of teachers carries so much weight. I feel that a great solution would be to allow people who were in the profession to travel and assess the teachers. You mentioned several quotes about how people love teachers ;however, I do not think they feel appreciated. I feel that people in higher positions should do a better job to improve the treatment of educators before there are not any left. Reflections on Teaching » Blog Archive » Thanks Met Life!